A whole month has slipped by with nary a post. When faced with slew of stresses, work and life related, I have a hard time staying creative let alone document and write about it. Excuses, excuses, I know. 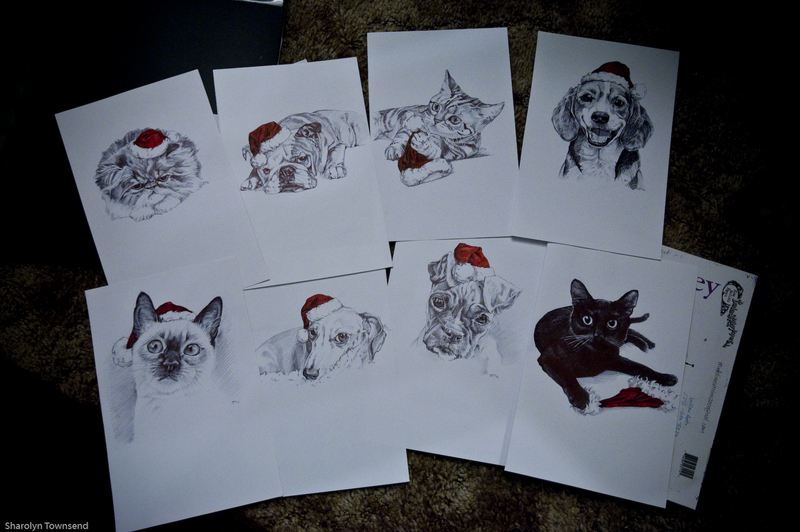 So, to show that I am not in a complete creative dry spell, I’m posting a pic of the work I’ve recently completed: cat and dog Christmas cards. I discovered that, while painting was almost too involved in the midst of all the things I’m dealing with, drawing is something I can do quite easily; all I need is paper and a ballpoint pen. I’m very happy with the results. This past Saturday I had these for sale at the farmer’s market for the first time. It opened a whole new can of worms with regards to requests for specific breeds, of which there are way too many to draw and have printed – but that is a whole other story. I’m quite happy with them…and crossing my fingers that others are too and want to buy them, or else I’ll be swimming in cards for the next couple of years and acquaintances will grow tired of the yearly pet Christmas card! Yes, Hello! I’m Still Here! These are so great! I want some sets for my shop! I keep wishing I had a furry friend of my own that I could get you to draw or paint. I may have to start going with the glass frames you use because I can’t find any small wood frames like these ones. You should get a furry friend…but then it would be hard to get away and visit me!